If you are buying a new rain jacket or any other waterproof garment, you may have come across terms like hydrostatic head and MVTR (Moisture Vapor Transmission Rate). While clothing brands and online shops are usually great at listing the values of these two parameters for their products, they rarely explain what MVTR and hydrostatic head mean and what can be considered a good value for each of them. Put simply, MVTR tells us how “breathable” a garment is while hydrostatic head tells us how waterproof a garment is. In the following we’ll explain how the MVTR and hydrostatic head are measured and what can be considered good values for each of them when it comes to rainwear. We will also compare MVTR and hydrostatic head values of different fabrics which are used for high-quality rainwear – like Gore-Tex, eVent, Pertex etc. Note that MVTR and hydrostatic head values are also used for tents and bivy sacks, but here we’ll focus on rainwear (e.g. rain jackets, rain pants, gloves etc.). What is the hydrostatic head? The hydrostatic head indicates the waterproofness of a fabric/garment. It is measured in millimeters and indicates the pressure of water required to penetrate the fabric. The fabric is put over the bottom end of a universal tube and then water is poured into the tube until the fabric leaks. For example, a hydrostatic head of 10.000 millimeters indicates that the column of water in the tube was 10 meters (33 ft.) high prior to leaking. Based on the information above, you might think that a rain jacket with a hydrostatic head of 1.000 mm (1 meter/3.3 feet) will keep you dry throughout a long rainy day but in reality even a jacket with a hydrostatic head of 7.000 millimeters leaks after it has been exposed to rain for several hours. Wind, heavy rain, the weight of your backpack and your movements put pressure on the wet fabric and make it leak faster. Therefore, waterproof garments are also treated with DWR (Durable Water Repellant) to simply repel the water and thus reduce the amount of water that passes through the fabric under heavy pressure (for example when it gets squeezed). For good waterproofness it is vital to reapply DWR from time to time. In general, fabrics with a hydrostatic head of up to 10.000 millimeters are suitable for light rain while fabrics with a hydrostatic head higher than 10.000 millimeters are suitable for moderate rain. Only fabric with a hydrostatic head higher than 15.000 millimeters will keep you dry in heavy rain. However, a higher hydrostatic head value usually also entails a higher price. Check out our reviews of the best hiking rain jackets (high-end rain jackets) to get an idea about the prices. If you want to learn more about rainwear (layers, waterproof technologies etc.) also check out our Comparison of Shell Materials. 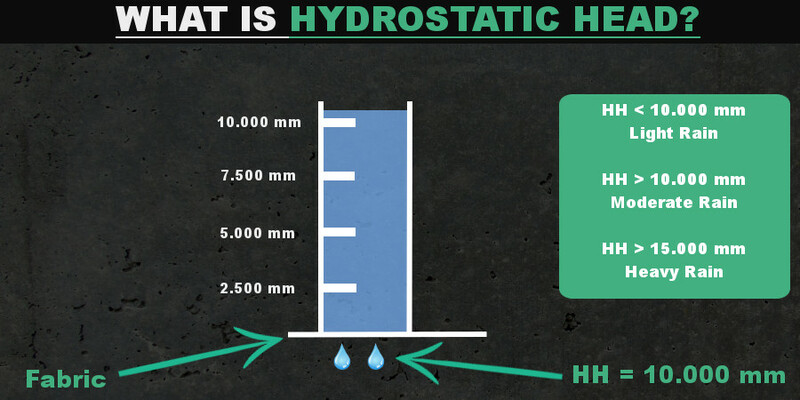 Infographics – What is hydrostatic head? MVTR stands for moisture vapor transmission rate and tells us how much water vapor can pass through the fabric from the inside out in grams per square meter per day. A waterproof garment should be able to transfer perspiration (water vapor) to the outside as it would otherwise make you soak in your own sweat. Clothing brands and outdoor gear magazines usually associate MVTR with breathability – which is not completely correct but has become standard practice. Why isn’t it strictly correct? Because breathability simply means how much air can pass through the fabric – and most waterproof fabrics can’t permeate air. 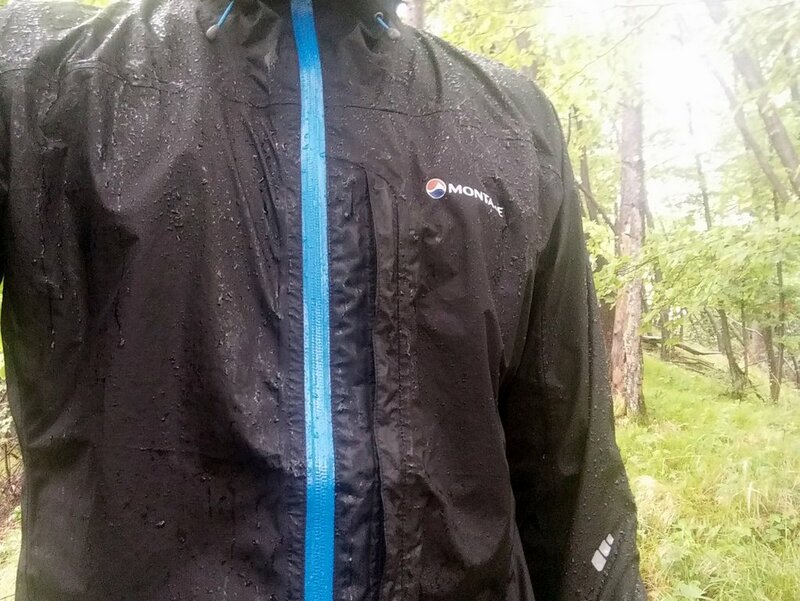 Try blowing air into your rain jacket and you’ll see that it doesn’t go through. Instead, waterproof garments can permeate moisture – in the way that when the moisture (from your perspiration) gathers on the inside of the fabric it gets pushed to the outside by body heat. That’s how most waterproof/breathable fabrics work. There are, however, exceptions; several high-end waterproof/breathable fabrics such as eVent DVstorm, Gore-Tex Pro and Polartec NeoShell actually do breathe (permeate air). Needless to say, rainwear made of these fabrics is also much more expensive than rainwear which doesn’t permeate air (fabrics such as Pertex, Patagonia H2No etc.). In general rain jackets with a MVTR of 10.000 g/m²/day or less are suitable for skiing and for around the camp activities while jackets with a MVTR of more than 10.000 g/m²/day are suitable for hiking, trekking etc. 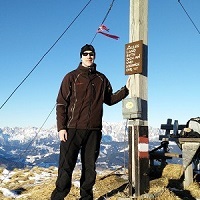 Only jackets with a MVTR of more than 15.000 g/m²/day perform superbly for highly aerobic activities such as mountaineering, alpine climbing etc. 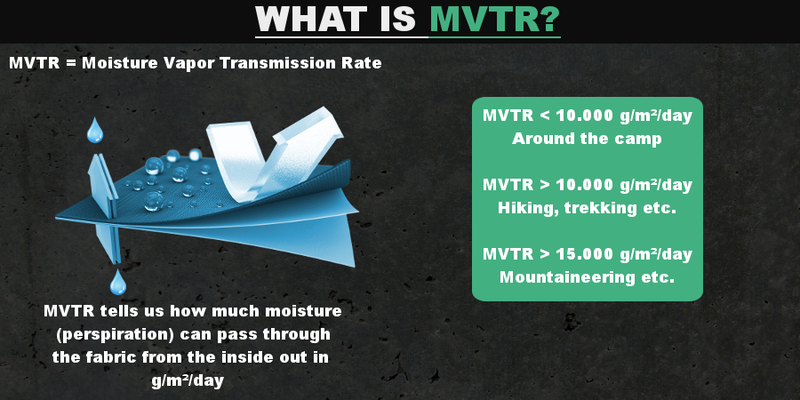 Infographics – What is MVTR? 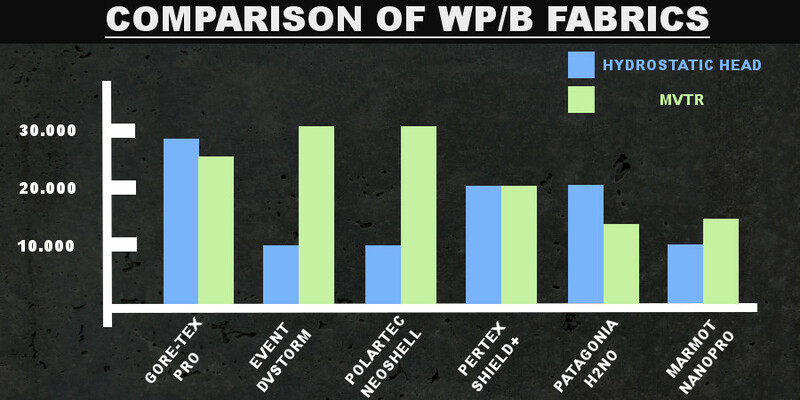 Infographics – Comparison of WP/B Materials – Gore-Tex, eVent, Neoshell etc. Gore-Tex Pro (not to be mistaken with the old Gore-Tex Pro Shell) provides great rain protection and moisture permeability. The fabric is, unlike the old Gore-Tex Pro Shell, also air-permeable. Gore-Tex Pro is the fabric of choice for high-quality rain jackets – for example the high-performance Arcteryx Alpha FL jacket is made of Gore-Tex Pro fabric. Also check out the Best Gore-Tex Jackets. The eVent DVstorm fabric provides even better moisture permeability than the Gore-Tex Pro and is also air-permeable. However, it doesn’t offer as good rain protection. The eVent DVstorm is the fabric of choice for highly breathable rainwear – such as the lightweight Rab Muztag jacket. Polartec hasn’t disclosed the MVTR value for their NeoShell fabric but it is by all accounts the most breathable (air permeable) waterproof fabric currently available. It has a similar hydrostatic head to the eVent DVstorm fabric. High-quality Montane Further Faster Neo jacket is made of the Polartec NeoShell fabric. Also check out the Best Polartec NeoShell Jackets. The Pertex Shield+ fabric differs from the fabrics listed above by utilizing a PU membrane. Therefore, it is not air permeable but still has a relatively high MVTR value. Pertex Shield+ rainwear is typically super light and packs very small. The fabric is used by Montane (Minimus line), Outdoor Research (Helium line) and some other outdoor brands. The Patagonia H2No fabric is less breathable, less expensive and bulkier than the Pertex Shield+ fabric, but on the other hand rainwear made of H2No fabric also tends to be less expensive than Pertex Shield+ rainwear. In general, the NanoPro fabric is slightly less waterproof than the Patagonia H2No but also slightly better at moving moisture vapor to the outside. It is in the same price range though. What a brilliant summary – finally someone demistifies the marketing cloud!